The MISU Screening Unit sources its power from the carrier units hydraulic system. When an order for a MISU screen occurs all specifications and variables are calculated out according to the specific carrier unit. 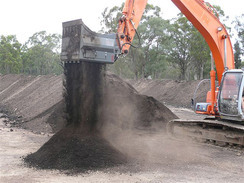 Excavator machines need to be piped for ‘Bi-Directional Flow’ to run the screen in two directions or clockwise or anticlockwise directions. The pressure in the circuit must be limited to no more than 200 Bar (2,900 p.s.i) and hydraulic oil flow set to the manufacturers specification’s. 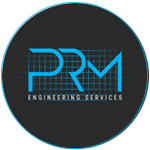 The pressure in the circuit must be limited to no more than 200 Bar and hydraulic oil flow set to the manufacturers specification’s. 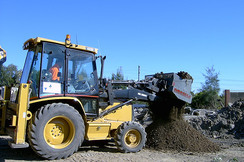 Skid Steer units run off the attachment hydraulic flow system. Ideally the weight of a carrier skid steer machine should be close to 3 ton for balance purposes. 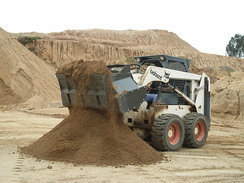 A suitable loader model is determined by the availability of hydraulic flow from the carrier unit and the type of material required to be processed. 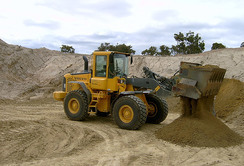 Our Excavator Units are available in six models. The tonnage of the carrier unit and the flow capability of the hydraulic system determine the unit most suitable for your application.